Father’s day—the day to celebrate husbands, fathers, and grandpas alike, is just around the corner. And, to celebrate, I’m sharing a brand new clip art collection. 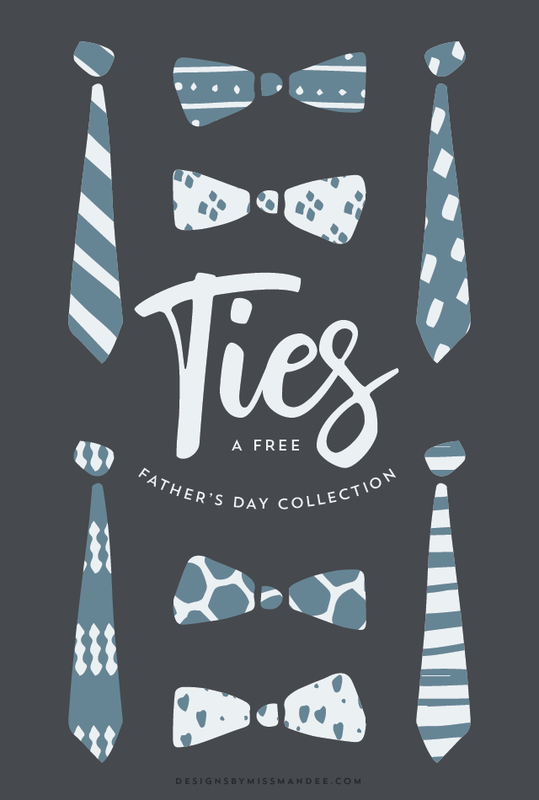 So, dress up your design for dad with one (or multiple) of these cute, hand drawn ties! These ties are just what you need add a hand drawn touch to a Father’s Day card, or create a pattern for your own wrapping paper. My dad is a high school history teacher, and he just happened to be MY history teacher in 9th grade. My dad’s pretty laid back, and there’s no way I could have gotten the hang of calling him “Mr. Miller,” so, in class, I always just called him “Dad.” Well, eventually this caught on, and a few other kids in my class started calling him “Dad” as well. He didn’t seem to have a problem with it. My grandpa somehow always had the energy to keep up with us grandkids. His house is out in the country, and they have a big, gravel driveway that goes up a hill and around to the front of the house. One of my favorite things as a kid was to race the red wagon they had down the aforementioned driveway. I would sit in it, holding the wagon handle, while my grandpa would get a running start and push me down the hill. All the while, I would do my best to use the wagon handle to steer around the bend. Most of the time it worked…sometimes there would be a crash landing. My grandma didn’t approve of this somewhat dangerous pastime, but we could almost always convince my grandpa to do it anyway. One time, when I was 13, I was playing in a tennis tournament about an hour drive away from my house. After winning my early morning match, I had another match to play later that afternoon. Since it didn’t make sense to drive all the way home, my dad took me to iHop for a late breakfast. We didn’t eat out very often, so, believe it or not, this was pretty special! This was the first time I ever ate at iHop and I’ve never forgotten it: it was so fun just to hang out with my dad (and, side note, the hash browns were incredible)! I hope you enjoyed those random, but fond, memories! And have fun implementing the cute ties in my new clip art collection. Darling ties and sweet memories! Thank you for the cute hand drawn ties just in time for Father’s Day.